Last week I presented at Gail Perry’s (of Fired Up Fundraising) events course. 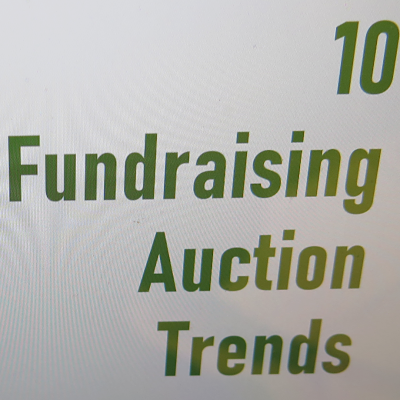 I commented on 10 trends in the fundraising auction industry, providing stories, context, and additional resources so participants could do a deeper dive on subjects of interest to them. Though I’m not going to provide commentary and resources in this blog post (you had to be in the course to get those), I thought you might be curious to see what I discussed. As you review the list, it’s important to realize that an old idea in your part of the world might be a new trendy idea to someone living elsewhere. For instance, consider the activity of a Dessert Dash. Dessert Dashes have been run on the West Coast for years but never been popular on the East coast. In fact, it took 12 years before I ran my first Dessert Dash in Chicago last fall and in Washington, D.C. this spring! To those nonprofits, the Dash was new. But out West, that activity wouldn’t be a trend. If you’d like me to present this topic or portions of it at your next conference, philanthropy day, or volunteer showcase, let’s talk. The Bridge Conference in Washington, D.C. on August 1, 2018. Auctions are constantly evolving — or should be. If you’re in a competitive fundraising area where all nonprofits seem to be running events, being ahead of the curve with a trendy auction is powerful. If you need an event re-boot, let’s chat.